17-year-old Ethan Cage is the main protagonist in this incredibly well constructed thriller. He was just 10 years old when his life changed forever after discovering his charming father, known as “The Mutilator” is found guilty of 18 unknown homicides in his hometown of Aton City, Marine. Not long after his father’s arrest Ethan discovers his dad’s journal in a special compartment in his dad’s tool box that the police had missed it in their first sweep along with other sentimental items. Ethan can’t simply understand why his father would commit such horrible atrocities and inflict so much pain and suffering on his victims and spends the next seven years of his teenage life in turmoil trying to figure out who he really is and if he is in danger of inheriting any of his father’s evil tendencies. On his journey of self-discovery a number of unforeseen events take place in which he has no control over as his father escapes from prison while mutilating two security guards in the process after re-wiring the entire prison system. Just as Ethan comes close to escaping his past, inches away from forging a new future with the girl of his dreams and really becoming someone, his father sends his life in to turmoil once again by sending him letters in cryptic form to let Ethan know of his next kill. Should Ethan go to the police? Or will he take the law in to his own hands and hunt down his father? 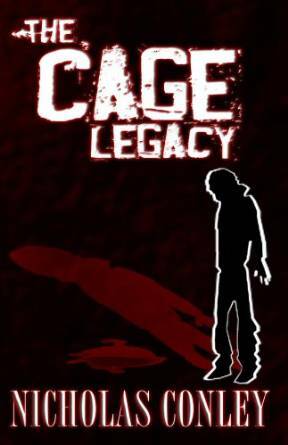 The Cage Legacy is an affecting story of a teenager’s battle to discover who he really is. Nicholas Conley expertly ratchets up the suspense until the tension is almost at breaking point in this fast paced psycho-thriller that’s really hard to put down. A taunt, well-written race against the clock thriller that is impossible to put down! 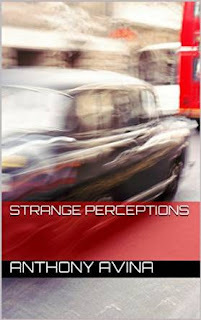 Strange Perceptions opens masterfully with the introduction of Lily Roberts – the novel’s protagonist – as she is celebrating her 24th birthday with her best friend Wesley in a Los Angeles restaurant. Half an hour later as they both leave the restaurant they spot a strikingly handsome man. The handsome stranger smiles at Lily and nods as he walks past her. Lily allows herself one last look before she turns around and collides with a scary looking living giant, unaware that all their paths will meet again in a matter of hours. Lily is about to suffer a terrifying ordeal at the hands of a brutal serial-killer who will stop at nothing to add her to his collection of victims. In her fight for survival Lily is about to learn a valuable lesson that will teach her never to stereotype anyone by their looks ever again, that’s providing she manages to stay alive long enough to tell her tale. I managed to devour all the 85 pages in just one sitting and enjoyed every minute of it. Anthony Avina skilfully blends elements of horror, suspense and mystery while keeping the story running at a fast pace as the unfolding situation slowly materializes – it’s taunt, well-written race against the clock thriller that is impossible to put down. Just how bad can a kid’s life get? When 13-year-old Timothy Star discovers his dad is running a campaign to be mayor of New York City and planning to marry a woman called Jessie while his mother is locked away in a mental institution with a severe neurological condition that he is in fear of inheriting. He also has a chance encounter with a beautiful teenage girl, only to discover that since the strange concurrence he has developed some freaky powers triggered by anger that results in his suspension from Van Dorn High School after he sets a girls hair on fire, burns down one of the science labs and tampers with the stands in the Gym that lead to many students being injured. Although Timothy has no recollection of the events, he does experience nausea and the strange smell of cleaning fluid before each attack. Timothy is given the option of either going to jail or a special school called Smithson and reluctantly decides the latter of the two options as his father’s lawyer and Dr Thorn convince him that the school will help him to control his new freaky powers. Timothy soon discovers all is not what it seems at Smithson and many of the students are low-grade junkies, as they are prescribed pills by Dr Thorn to keep them all mellowed out. When Timothy hears that the school is built over tunnels of an old missile base, he goes on a mission to explore the base and finds much to his surprise it is still in use and hosts pathways to galaxies of other worlds beyond earth that he had no clue existed. As Timothy tries to unravel the mystery of what really goes on in the missile base, strange things start to happen, a pupil gets bitten by a strange creature, another pupil gets attacked by a throwing star and the detective who is called in to investigate gets killed in a car crash. 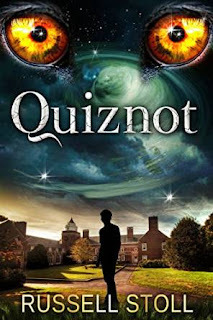 Timothy does his best to try to piece all the unusual events together, but nothing prepares him for the next set of events where he has to fight for his survival against alien monsters and other creatures he has never seen before, unaware of a powerful being called a Quiznot that plans to rise on planet earth and take control of it. Will Timothy’s new powers be enough to save his life and if so at what cost? Or will his new powers shape his future in a way he never envisaged? What a wonderfully crafted story! I was pretty much hooked from the start and look forward to reading more books in this planned trilogy. Russell Stoll has successfully created a thrilling young adult/sci-fi/fantasy book with a likable heroine that the reader can get behind and root for as he is strong, brave and loyal. The only disappointment I had is that I must wait to hear more of Timothy’s adventures and can’t wait to see what they entail. I expect an exciting epic to be awaiting this heroine. Smokescreen. A Novel by Khaled Talib. Book Trailer. "One of the best espionage thrillers around!"